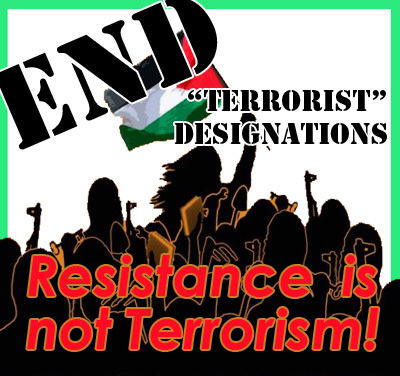 European Union, Canada and the United States, numerous organizations – including many national liberation movements and organizations – are listed as “designated terrorist organizations.” This status is used in an attempt to criminalize popular resistance and national liberation movements, equate those movements with “terrorism,” frighten and silence communities’ support of their national movements, and potentially penalize supporters of the Palestinian cause, as well as other national liberation movements. The Popular Front for the Liberation of Palestine is, alongside a number of other Palestinian political organizations, listed and designated as a “terrorist organization.” This designation, while doing nothing to change the fundamental character of our movement, is an attempt to isolate the resistance, strike fear in the hearts of our people, and enact U.S. foreign policy of massive support for Israel through the false use of a “terrorist” designation. This designation is illegitimate, and an attempt to use the legal system to criminalize and demonize the Palestinian cause. It is an attempt to silence our people in exile through the use of fear and intimidation. Furthermore, it goes hand in hand with the funding, arming and support of Israel by the United States; the so-called “terrorist” designations are merely another weapon placed in the hands of the occupiers of Palestine. Furthermore, this designation is a dangerous threat to freedom of speech and association, threatening all – especially immigrants and refugees – with unjust persecution merely for working to bring justice for Palestine. These unjust designations can and must be undone. But a de-listing cannot and will not happen without loud voices speaking clearly to the use and abuse of “terrorist” designations to criminalize a people. Our movement is a just movement for national liberation, a cause supported by vast reams of international law and fundamental human rights principles, and our resistance is a just resistance against a brutal occupier on our land. This designation harms popular movements for freedom and justice in Palestine, and it is a mechanism of unconditional support for the occupation of our land and the dispossession and oppression of our people. Please join us today to demand an end to the listing of the PFLP as a so-called “terrorist organization.” We are collecting statements, petitions and letters in support of a call to end this designation. Contact us and select “Support the campaign to remove ‘terrorist’ designation” and send us your letter of support today! This is the stranglehold all of us are kept in! That we can’t be allowed to recognise a resistance movement when we see one. Especially here in “Free Europe”, where we had the Partigiani, the Maquis, all the various armed groups that resisted Nazism and Fascism. As soon as “someone” has decided that these groups are “terrorist”, despite the fact that they don’t drop bombs on civilian populations like the armies of the US and Israel, that effectively scares everyone off and shuts them up. So many times I am amazed at how much propaganda and lies are told about legitimate resistance movements, just as a way of eliminating any popular support for them. If that would have happened in 42-45, right now we’d still be in the Third Reich. Instead, we have American Imperialism which is just as murderous, even though it uses different means to control and oppress anyone who fights its will to dominate.